As the market leader in enterprise application software, SAP is at the center of today’s digital business and technology revolution. SAP has always been about helping our customers streamline their processes, helping them achieve efficiencies across their organization, ultimately supporting them in executing on their short and long term business goals. By gaining real-time data-based insights, our customers can see and act on customer trends across their entire business. SAP’s commitment to an API-first based approach across our line of business applications is demonstrated by such market leaders as SAP C/4HANA, SAP S/4HANA, SAP SuccessFactors, and the SAP Concur solutions publishing content on SAP’s API Business Hub. Read our CIO guide on enterprise integration strategy for more detail on SAP’s API-first approach. By providing effective, secure and scalable API’s, we ultimately make it easier for our customers to achieve the seamless enterprise landscape they seek with access to real-time data that can be used in turn to impact their businesses. When direct API calls are not enough we offer customers comprehensive SAP Cloud Platform Integration Suite to achieve their desired business outcomes. We strive to deliver integration tools that make our customer’s lives easier, helping them execute on their data sourced initiatives and projects. We help our customers by providing user friendly tooling, achieving real-time visibility, and ultimately obtain business insights. Here are my top 5 reasons for why SAP’s approach to Integration can benefit your organization. SAP also offers our customers access to SAP’s API Business Hub, a central catalog of SAP and partner-sourced APIs. Customers can use the API Business Hub to accelerate their search, discovery, and use of API-based prototypes by using the hub’s sandboxing and testing capabilities. Currently, there are over 700 APIs listed in the hub—and as SAP founder Hasso Platner said at this year’s SAPPHIRE event, the goal is to publish over 5,000 API’s. An API-first approach also reflects the reality that over the past few years SAP has acquired multiple best-of-breed cloud SaaS applications that feature their own heritage, technology, and approach to their respective line of business verticals. API-based integration enables our customers to harness the best features of these respective solutions while at the same time benefiting from a seamless cross-domain landscape that works in harmony with our digital core-powering SAP S/4HANA ERP capabilities. #4: How about Some Prepackaged Content? API-first doesn’t mean API-only. There are going to be circumstances where some degree of orchestration is required. To support these scenarios, SAP offers SAP Cloud Platform Integration service (SAP CPI). SAP CPI provides customers with not only an easy-to-use process orchestration integration tool, but with CPI pre-packaged integration content that allows for rapid implementation. Other integration providers encourage their customers to commence building a robust integration hub that promises to take care of every integration need (whether needed or otherwise). But a central hub approach typically takes a lot of time and effort, eventually requires associated governance and prioritization as bottlenecks appear. Worse still, it ultimately locks these customers in given all the time and money spent invested in developing hub-centric vendor-specific content. A distributed cloud landscape can be daunting, but as businesses become more and more digital, customers need a landscape that is flexible, adapter and agile. One that ultimately supports their business, not one that holds it back. 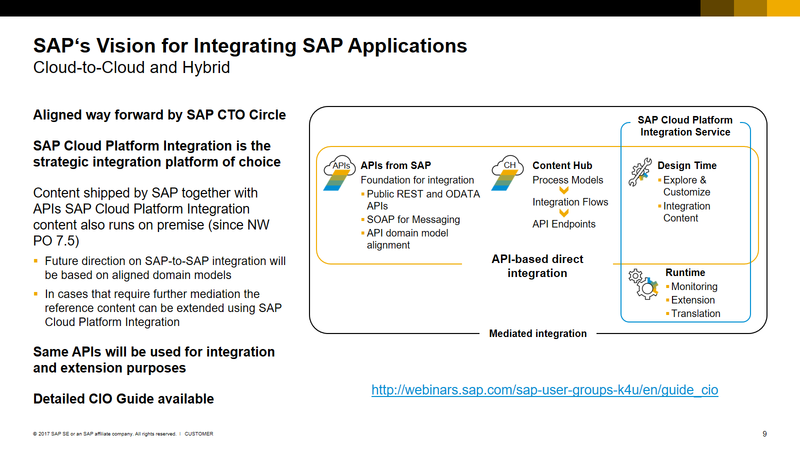 On top of our API-first and CPI based capabilities, SAP Cloud Platform Integration Suite also features our cloud-based API Management capabilities. This end-to-end API Management solution provides customer with the ability to build and manage their own APIs. Being an API publisher ourselves, we’re able to provide customers guidance on how to drive adoption and ultimately foster a vibrant API community. We realize our customers use API Management for a rich combination of reasons. Whether they are seeking to manage an internal and external exchange of data, provide mobile developers an easier path to building cutting edge applications, or simply seeking to monetize data via a metered gateway—we’ve got them covered. Finally, I want to point out that we offer SAP Cloud Platform Integration Suite as part of our broader platform-as-a-service solution (PaaS) that is consciously designed to provide customers with the broadest and richest set of tooling possible to facilitate rapid application development. These applications can be extensions of our previously mentioned line of business applications or net new applications that help our customers provide their business stakeholders with the real-time capabilities they need to be successful. A lot of the integration players in the cloud space only address integration needs. At SAP, we strive to provide our customers with a richer value proposition. Not just integration for the sake of information exchange, but integration as part of solving business challenges. In other words, not only do we seek to solve a customer’s technology challenges, we ultimately want to provide our customers with technology that solves their ongoing goals and aspirations. Check out our free public trial and find more information at cloudplatform.sap.com.